Through Doris’s writing it is evident that she is extremely fond of schooling, education and reading. She flourished in school at an early age and at the age of six she was even reading Dickens’ from her Uncle Joe’s collection. Although she found it hard going she conquered the first few chapters before her family moved onto their next destination. In the following years she finished every single Dickens novel including her first attempt at Bleak House. Doris tells us that ‘literature is something one must grow into, not be pushed into, like a non-swimmer into the deep end’ (p2). However, a lot of children did grow into the habit of reading as there were no TV’s or even radios at this time for entertainment. Doris looks back over her school years with great joy and pride and in her autobiography she recalls fond memories of teachers, lessons and general schooling. Her enjoyment of her school years is confirmed as she tells us that ‘I was very happy at that school and remember it with gratitude’ (p7). 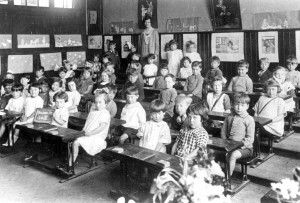 Due to her family moving around England Doris and her sisters often had to move schools: ‘the school I attended during those few months 1906-7 must have been about the third of my scholastic career’ (p2). At just the age of six or seven she was attending her third school. When she and her family moved to Littleborough in 1911 (after her father’s death), the Hunt sisters attended the nearby Parish Church school. Doris tells us that the school was ‘made famous by Gracie Fields, the Lancashire Comedienne’ (p7). 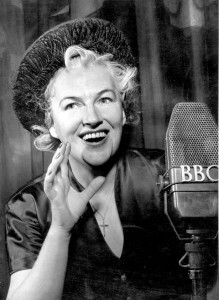 Gracie Fields was an actress, singer, comedienne and star of both music hall and cinema. She was made a Commander of the Order of the British Empire in 1938 for services to entertainment and in 1979 she became a Dame. When Doris first arrived at the school in Littleborough, at the age of 11, they found that she ‘had reached the education standard of the 13 year old’ and so ‘was put into the top class’ (p8). She tells us that whilst in this class she was made quite a fuss of due to her age and size. They made even more of a fuss when they discovered that she could recite Mark Anthony’s speech in Julius Caeser, something she had learnt at one of her previous schools. Doris recalls this very fond memory of hers; ‘So they put me up on a chair in front of the class, and had other classes and teacher in to listen to me’ (p8). She tells us how she often smiles even now to think of her small, quaint self perched up there, ‘declaiming like an orator’(p8). She seems bursting with pride, even 60 years later when she states ‘I’ve never had such confidence since, nor felt so important’ (p8). This illustrates her infinite pride in regards to her intellectual ability and achievements . Doris was very fond of one her teachers as she tells us that she loves ‘to remember the teacher who taught me for the last two years of my school life- Mr, W. A. Parker’ (p8). It seems clear that she thought a lot of him as a teacher as after 60 years she could still recall him saying “Never believe all you hear, but ALWAYS believe all you Say. And “He who excuses himself accuses himself” (p8). Doris confirms her fondness by stating that ‘He was a wonder, unique teacher, one in a hundred’ (p9). Doris’s love of education and learning was long-lasting as it carried on throughout her teenage years and even through adulthood. At the age of 13 when Doris left school altogether for full time work she attended evening classes. This consisted of ‘three evenings a week (and later four) after working 10 hours a day in the mill’ in which she partook in ‘two hours of advanced arithmetic, English language and literature, including commercial English, shorthand, typing and book-keeping’ (p11). The fact that she applied herself to two hours of leaning after a ten hour working day demonstrates her pure enjoyment of education and her ambition to succeed in life. Education was even incorporated into her leisure time. As an adult as she became a member of an ‘English students’ association’, in which she was elected Secretary. This enabled Doris to both continue her learning and socialize with people of the same intellect. Despite Doris’s fond memories and love of education, she had to overcome various obstacles in order to pursue the education she desired. Within the same year as her father’s death, Doris had passed exams meaning that she had qualified for the option of higher education. To make this possible Doris’s mother would have had to pay a fee of ‘6d per week’ and also guarantee to keep Doris at school until the age of 14, four more years. Doris tells us that ‘neither of these conditions were possible’ as earning money was often seen as a higher priority than education for many (p6). This therefore meant that Doris continued attending elementary school, the basic schooling available for working class children up to the ages of twelve – thirteen. After the passing of Doris’s father her mother entered the working world, becoming the breadwinner for the family. This began the domino effect of change within the family. Doris had to take on more responsibility, such as looking after her youngest sister when she got home from school whilst her mother was still working. At the age of twelve Doris had to go from full time school to ‘half time work in the cotton mill and only half time at school’ (p9). Although her education supposedly did not suffer as she was already at such a high level, she claims that this is when her’ childhood really did finish’ (p9). Doris’s timetable consisted of, for one week, five mornings at the mill from 6:00 to 12:30 and 5 afternoons at school. Then the following week consisted of five afternoons of 4 hours and 5 1/2 hours on Saturday mornings at the mill alongside five mornings at school. Doris claims that ‘We thought nothing of it in 1912, but now I’d shudder to think of children having such a life’, all for ‘less than 1/2p an hour- almost unbelievable now’ (p9). This shows a movement of realisation for Doris as when she is looking back writing her autobiography she sees a great difference in regards to attitudes to work. As readers we see an even stronger contrast to the world we live in now. Entering the mill was like the beginning of the end of childhood. This became a reality for Doris at the age of 13 when she left school altogether for full time work in the Lancashire mills. This confirms that due to the demand for extra wage earners in working class families it meant that children only had a few years at the most to grasp the opportunity of school life. Being withdrawn from school was seen as a loss for working class children as for the first time they see themselves as poor and deprived. They feel hard done by in comparison to their educated peers. This links to something key that Doris says in her autobiography, she states that she ‘was ashamed of the fact’ that she was a ‘mill-girl’ (p10). This highlights her utter disappointment at the fact that she had to leave school early to work at the mill. The fact that she was ashamed of being a mill girl suggests that she knew she was capable of much more and expected more for her future. This is confirmed by her comment ‘had my father lived I was going to be a teacher’ (p10). This indicates that if the family dynamic hadn’t altered and Doris has not had to choose employment over education then her future could have been much brighter. Overall, this suggests to us as readers that those who were deprived of education were the ones who longed for an education and future beyond working in factories.